TOUR DATES 04.06 Steel Yard, London, UK 04.19 Akvarium Terasz, Budapest, HU 04.20 Feszek Klub, Budapest, HU Bookings - bookings@comportrecords.com 'Theory Of Love' Official Music Video http://bit.ly/1WUgiJK 'Theory Of Love' Album OUT NOW via @comport-records : https://lnk.to/IwP7E DJ | Producer | Live Act | Comport Records Dansor is fast cementing herself as one of Holland’s hotly tipped electronic music artists. Founder of Comport Records, the Hungarian-born Producer and Media Technologist is also the former winner of Pete Tong’s Bedroom Bedlam and Dave Clarke’s ADE Demolition panel. 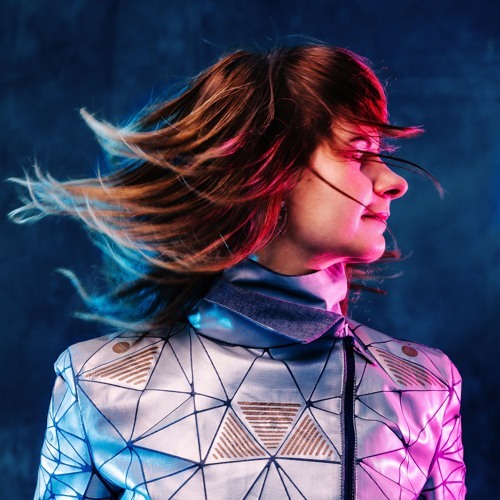 An established Live Act as well as a DJ, Dansor’s performances have graced Sziget Festival, Ozora Festival, Balaton Sound, not to mention an inventive appearance at ADE where she performed her debut album ‘Theory Of Love’ live alongside jazz musicians, or her interactive AV performance during TEDx with a sensor jacket and Ewa Pepper violinist. Born and raised in Budapest, Hungary, she grew up listening to Duran Duran, Depeche Mode and Kraftwerk before moving to the Netherlands in 1997 - a switch that would play a significant role in intensifying her relationship with all things house and techno. Throwing herself into the scene, she found home in the work of electronic acts such as Art Of Noise, Leftfield, Front 242 and clubs such as “Feketelyuk” (Black Hole) and “Zöldség-Gyümölcs” (Fruits and Vegetables), not to mention the acid house parties that sprung up during the time. Acquiring a taste for illegal raves in her home of Budapest, she later left due to the country’s economic situation to make her way to the Netherlands in search of a new lease of life. It was here where she acquired her first set of decks and also made friends with Dutch producer Georgio Schultz who pushed her towards installing Cubase on her Atari computer. She would later establish her ‘WomenWaves’ parties in her adopted town of Haarlem, followed by ‘Budapest Delight’, 'BLD', 'HOTCHPOTCH' and 'BLEND' events in Amsterdam. The" DANSOR" project was born during the final semester of her Media Technology studies in the ‘00s. A live act that could be controlled without the need to stand behind a laptop, it didn’t immediately set pulses racing - with even the lady herself admitting that it was way ahead of its time. What it did prove beyond any doubt, however, is that Dansor is a producer not intent on taking the traditional route. Such avant-garde approaches course throughout her productions too. Unsurprisingly, then, they’ve been picked up by a host of seminal worldly imprints including Little Mountain, This Is Recordings, Nervous Records and Tulipa. This is replicated in similar vogue via her Comport Records that also plays host to her intricate sound by incorporating elements from house to techno to dub, jazz/funk, italo disco, new wave and indie. Ahead of her debut album ‘Theory Of Love’, Dansor has released a selection of singles from the long player, including remixes from Channel X's Jiggler, Animal Picnic, Thomas Gandey, Zoe Xenia, Sezer Uysal, Just Her and Natural Flow. These have received support from the likes of DJ Mag, Complex, Electronic Groove, Ibiza Voice, When We Dip, 8 day Montreal and her remix of Digitaria's ‘Useless Fantasies’ even picked up support from Rolling Stone. Dropping her debut album at the start of 2016, ‘Theory of Love’ garnered a glowing print review in DJ Mag, radio support from the likes of BBC Radio 6 Music’s Nemone, John Digweed and Jonty Skrufff, not to mention topping the Beatport charts with the release hitting no.1 in Breaks, no.14 Electronica, no.18 Deep House, no.23 in the Tech House - resulting in an overall Top 100 appearance at no.93. Now, with her live set evolving and Comport Records maturing, 2019 looks to be the most propitious year yet for this bright and promising individual.